I, along with half of America, am having a really bad week. Actually, I’m having a really bad year. To combat the post-election blues and the everyday-blues, I’ve been shoveling assorted junk into my mouth and slowly gaining weight that I swear I’m going to lose. Going along with this week’s themes of regret, disappointment, and remorse, I almost ruined a relatively simple chocolate chip cookie recipe. They ended up being perfectly chewy in the middle and crispy around the edges though. Here is my recipe for disaster. Step 1: Melt 1 stick of butter (aka 1/2 cup) in the microwave. Then whisk in 1/2 cup of packed brown sugar, 1/4 cup of white sugar, a teaspoon of salt, and a teaspoon of vanilla extract. After the mixture is uniform, mix in 1 egg yolk. Step 2: Then, combine 1/2 cup of flour with 3/4 teaspoon of baking soda (look at the tiny whisk!!!!). Whisk in the dry ingredients into the wet mixture (with the normal-sized whisk). Step 4: I separated about 1/3 of the dough and mixed in some crushed pretzels because I’m an interesting person, dang it! I covered both of the dough bowls and let them chill in the fridge for about 30 minutes, and preheated the oven to 350°F. Step 5: To shape the cookies, roll about 1 rounded tablespoon of the dough into a ball and flatten it into an oblong disk, like a cow patty. Then roll a slightly smaller ball and smash it on top. Bake the cookies one tray at a time, for an undisclosed amount of minutes. The oven timer stopped working during BOTH batches, but I am going to guess it took between 12 and 15 minutes until the edges became golden. Just take them out when they look ready, jeez. Step 6: Once the cookies are out of the oven, they look like flat turds. 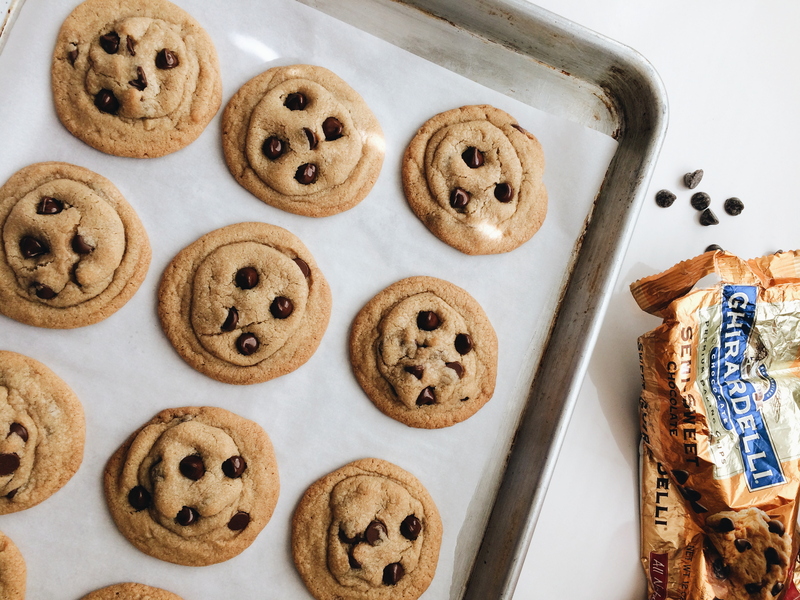 To make them look more like all-American chocolate chip cookies, press a few extra chocolate chips into each one while they are still hot. Let the cookies sit on the pan for a few minutes before transferring them to a cooling rack. The pretzel cookies didn’t spread as flat as the regular chocolate chip batch (because physics), but the added crunch is nice. ← Pumpkins, am I right?